This is a Mixed up letter Thanksgiving Theme Mayflower alphabet worksheets. This contain an image of Mayflower on which alphabets both upper and lower cases are given. In flash cards the letters are written on primary lines so that children can see and write the letters in correct form on the worksheets. 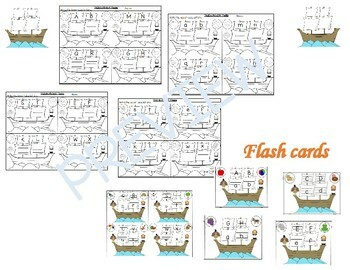 Student will pick one flash card and will find the same letter on the worksheet, say the beginning sound and letter then write its Upper or lower case (as mentioned). Pictures are given to recognize the beginning sound easily. They can also color the images on worksheets after finishing the writing. Note: Letter l, m, f, g, r and s are repeated. Cut the flash cards (4 per page), laminate them for longer use. This pack can also be used for review, in writing centers or assessment.